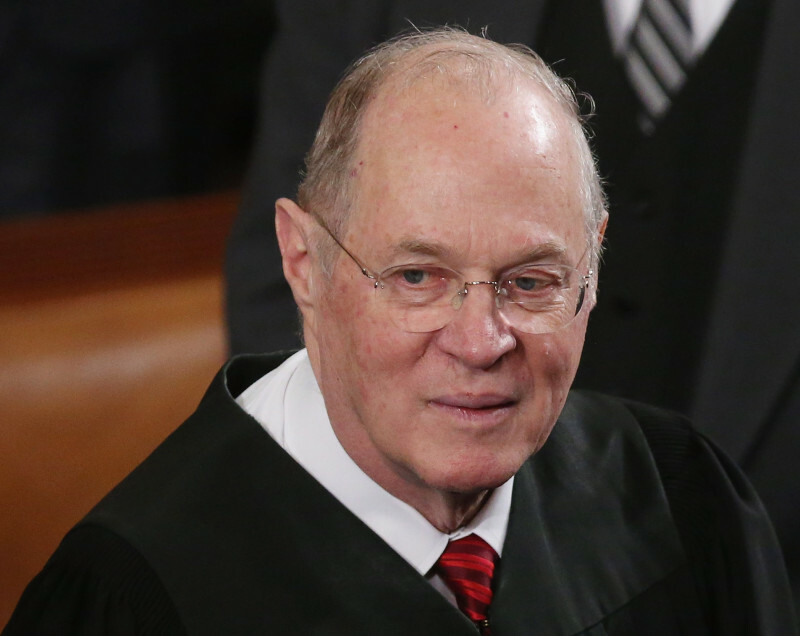 Does Fate of Independent Redistricting Lie in Anthony Kennedy's Hands? It certainly has all the makings of a good dramatic script: partisan schemes inside the halls of power ... thwarted years ago by voters at the ballot box ... now facing the judgment of a court whose tie-breaking vote lies in the hands of a man who himself dabbled in the hurly-burly of state politics and government. The star of this drama is, perhaps not surprisingly, U.S. Supreme Court Justice Anthony Kennedy. And the plot revolves around whether voters can wrest away from legislators the power to draw political maps. In a hearing that lasted 61 minutes, according to the official transcript, the nation's highest court on Monday weighed the constitutionality of Arizona's independent redistricting commission -- a case that could not only strip that state's commission of its power to draw maps for the U.S. House of Representatives, but which also threatens the viability of a similar system here in California. Kennedy has long been the man in the middle on the U.S. Supreme Court. But before pondering the various legal arguments in Arizona State Legislature v. Arizona Independent Redistricting Commission, let's remember the biography of Justice Kennedy, born more than 79 years ago in Sacramento. Kennedy's work on what became Proposition 1 seems to have won respect from Reagan, even though voters rejected the initiative. Kennedy was appointed to the federal bench in 1975, and we all know where both men went from there: Reagan to the White House in 1980, Kennedy to the U.S. Supreme Court as Reagan's appointee in 1987. All of this is to say that Anthony Kennedy no doubt knows well -- more than any of his fellow justices -- the power that initiatives give to voters to work independently of legislators in writing laws. Which brings us to the case of Arizona's redistricting commission, created by … yep ... voters writing their own law. On Monday, Kennedy seemed squarely in the middle of the tug-of-war over the legality of Arizona voters cutting the state's legislators out of the picture when it came to drawing congressional districts. The crux of the case is whether the United States Constitution's guidance on elections to Congress limits involvement to an elected legislature ... or simply allows decisions made through the use of a state's legislative power, a power in which Arizona and California both divide between elected officials and voters at the ballot box. The leaders of the Arizona Legislature who brought the lawsuit say the Constitution's words have one simple meaning. "It means then what it means now, which is a representative body of the people," argued attorney Paul Clement about Article I, Section 4: The times, places and manner of holding elections for Senators and Representatives, shall be prescribed in each state by the legislature thereof. "What we object to is the permanent wresting of authority away from the state legislature," Clement, a former U.S. Solicitor General, told the nine justices. On the other side was Seth Waxman, also a former U.S. Solicitor General and representing Arizona's independent redistricting commission. "Arizona," he said, "defines its legislature in its constitution to include both the people and two representative bodies." The court's more liberal wing seemed to largely ask questions and make arguments that support the independent redistricting commission's power to draw Arizona's nine congressional districts; its conservative members, on the other hand, stuck to the idea that only an elected legislature has authority to hold the reins of how a state elects its members of Congress. Said Justice Elena Kagan, when describing how many laws are written in states like Arizona by voters flexing their legislative power: "The sort of purity of the originalist argument that a 'legislature means a legislature,' well, we are miles away from that, aren't we?" And from Justice Antonin Scalia, disagreeing that legislative power means more than just a body of elected officials: "I don't think it was a consensus definition at all. You've plucked that out of, out of a couple of dictionaries." So what of our main character, the jurist from California? Court watchers will make their own expert judgments, but it certainly seemed like Justice Kennedy was weighing both sides carefully. 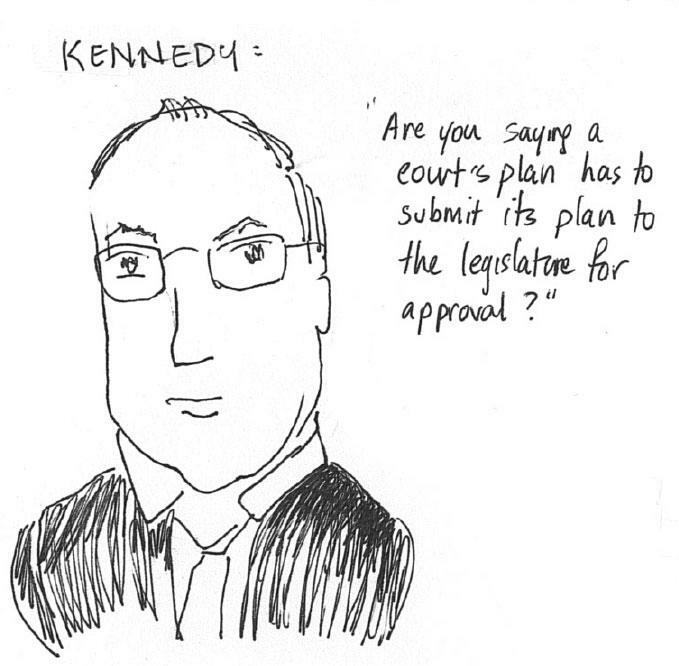 When discussing how courts have had to step in when legislators were believed to have unfairly drawn maps (as happened in California three times in the last four decades of the 20th century), Kennedy suggested there are times when the power of the Legislature over redistricting is not absolute. "It seems to me that that's as much of a displacement as what you're talking about here," Kennedy said to the attorney representing Arizona lawmakers. On the other hand, Kennedy seemed skeptical of the more lenient definition of legislative power being argued by the Arizona commission's attorney. "It seems to me," he said, "that history works very much against you." That kind of poking and prodding is what judges often do in deciding the merits of one side or the other. It doesn't tell us where Kennedy, who once drafted an initiative to sidestep a recalcitrant California Legislature, will ultimately land on this case. A number of legal observers believe that California's independent redistricting for congressional districts won't survive if Arizona's system is nullified by the Supreme Court. And that could make it quite possible that Anthony Kennedy's name -- like those of Hiram Johnson and Howard Jarvis, among others -- will be remembered as an important character in the long story of California voters taking power away from their elected representatives in Sacramento.